This week I intended to present a snapshot of our day. As I was looking in detail at each part of our day, I realized "a quick snapshot" may have been unrealistic. There is purpose behind everything we do at The Gan. We strive to begin each day with a bright and vibrant greeting. A joyful hello can demonstrate to the the child we want him/her to feel welcomed, and respected. An extension of that respect is "reading" the child and recognizing when he/she may want to simply enter into the classroom without a big hello. As we continue to greet our friends, the children have the opportunity to ease into the classroom for a brief period of free choice activities. They may choose to walk around and observe what others are doing, and find something that intrigues them. 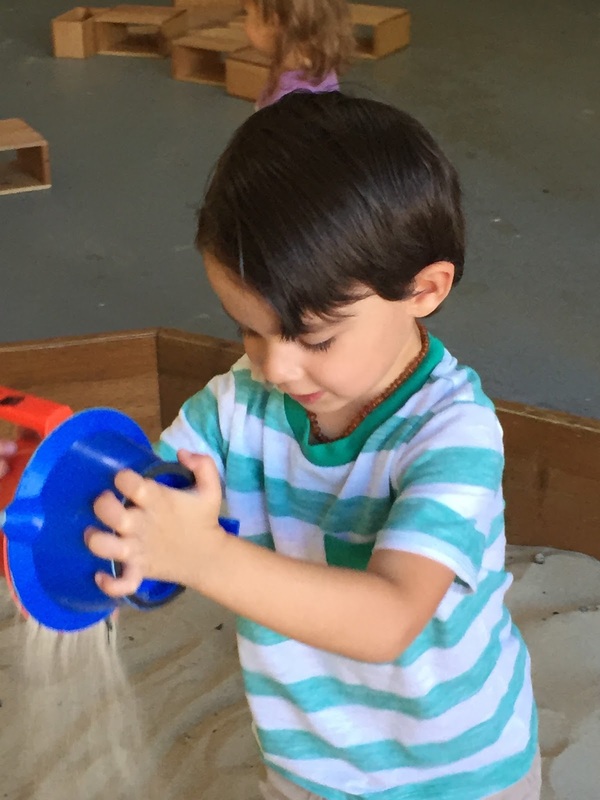 The children learn that with the privilege of free-choice, they are expected to play responsibly with the materials and put them away when free-choice time is over. As the children "work" to put the activities back, they build friendships through cooperation. Olivia was putting the play dough away. Evan, Matan and Ari offered to help her. The boys decided that play dough would be more fun to return if they made planets and placed them in the galaxy. The boys then showed Olivia where the play dough belongs on the shelf. Children benefit from gathering with all of the children. Our morning meetings are opportunities to develop early literacy skills as we answer a daily question, and math skills as we update the calendar. Socially, circle time helps the children develop self control and important social skills such as sharing and taking turns. If a child is talking while a friend or teacher is talking, the words “bump” together making it difficult to be heard and understood. How can we hear the very important thing they are trying to say if their words are bumping into someone else’s words? How can we hear the story? Sing the song? and we in turn know our voice is valued. Circle time encourages a feeling of community, we all love singing, we all love listening to books, we all love to contribute what we know. 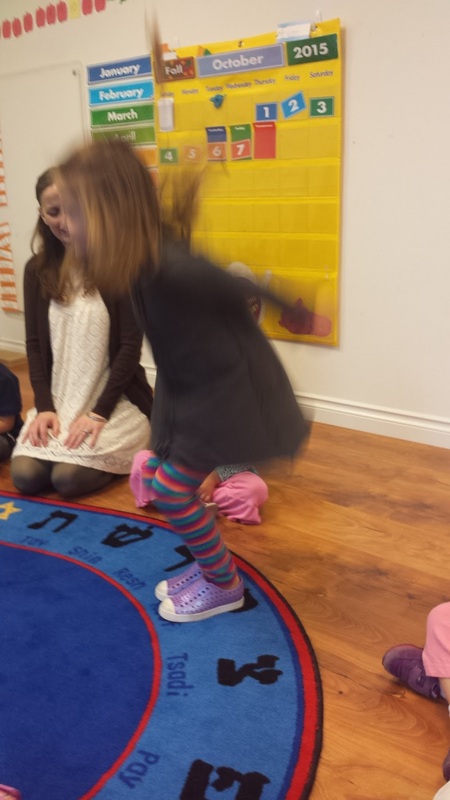 As leader of the day, Olivia collects tzedakah. Each day at morning meeting we choose a leader of the day. The leader of the day counts how many friends are at school and chooses two friends to help gather tables for snack. The small group of helpers needs to determine how many tables and chairs will be needed to accommodate the group of friends for that day. Some days we use all the available tables, on other days we may need just one table. The leader becomes the host for snack. He/she washes his hands and begins to pass out plates. This is an opportunity to watch how the child's mathematical mind is developing. Early stages of mathematical thinking shows us that children use 1-1 correspondence (1 plate for 1 child). 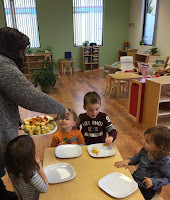 As the child's understanding of number develops, the child can remember he/she needs to set the table for 11 friends, and choose to collect 11 plates to pass out all at once. This maturity in thinking just "appears". The child doesn't say: "Today I have figured out that 11 friends at roll means 11 plates." This understanding is something that is demonstrated through his actions. Observing how the leader sets the table, gives the teachers a passive way to observe this development. My young friends develop the life skill of patiently waiting in line. Clara: It just isn't nice to cut in front Nora. Augie was there and we have wait. You don't like getting cut in front of. The children reinforce friendships as they wait for their turn, and learn to pass the time with conversations. 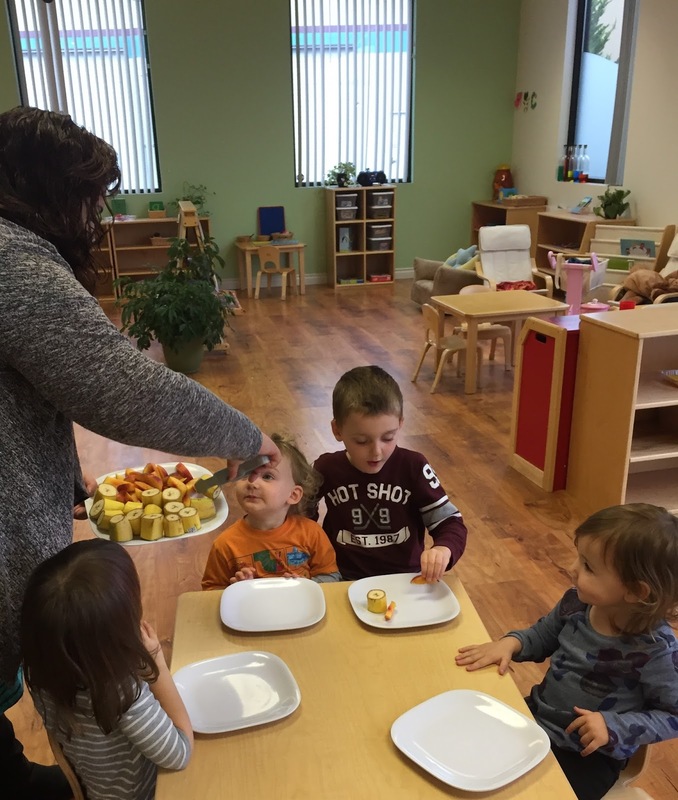 Snack time provides the children an opportunity to practice sweet and kind responses as Morah Breanna offers the snack. A child may not be a fan of nectarines, in which case he may practice saying, "No thank you" and "Yes please," for the cantaloupe. Judah: May I please have more bananas and nectarines Morah Breanna?" Morah Breanna: Yes Judah thank you for asking so politely. Once we are done with our snack, each child washes their plate. The children are contributing to the care of our classroom, as well as developing coordination and concentration to follow through on a multi step task. 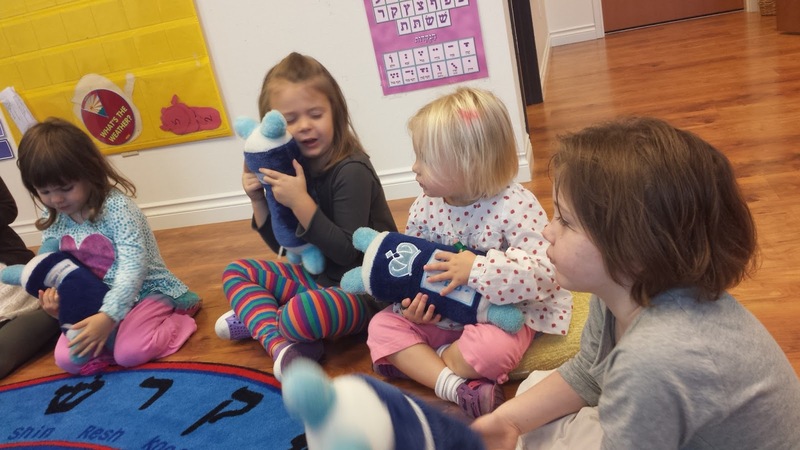 Children join their friends for some independent reading time, and sharing of stories. 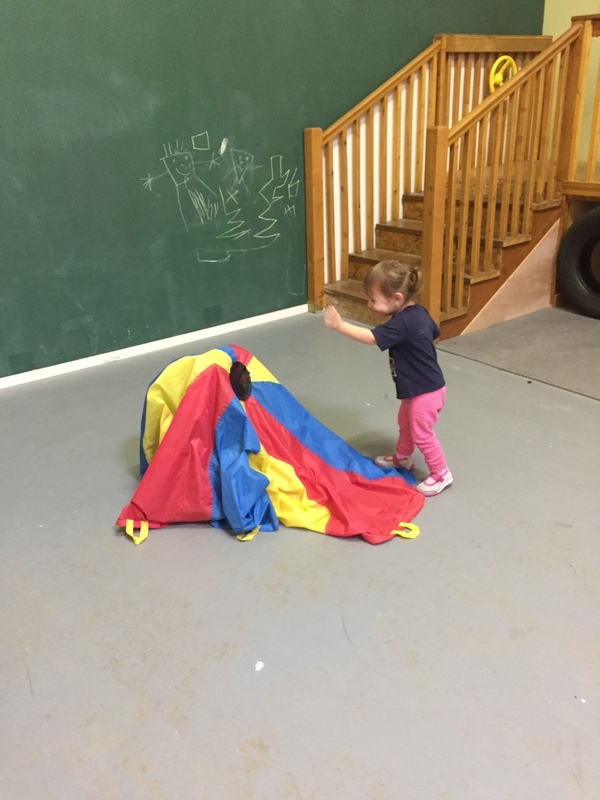 Children’s natural enjoyment of active play and their desire to interact with others create great opportunities for gross motor development, the abilities required to control the large muscles of the body for walking, jumping, skipping, and more. 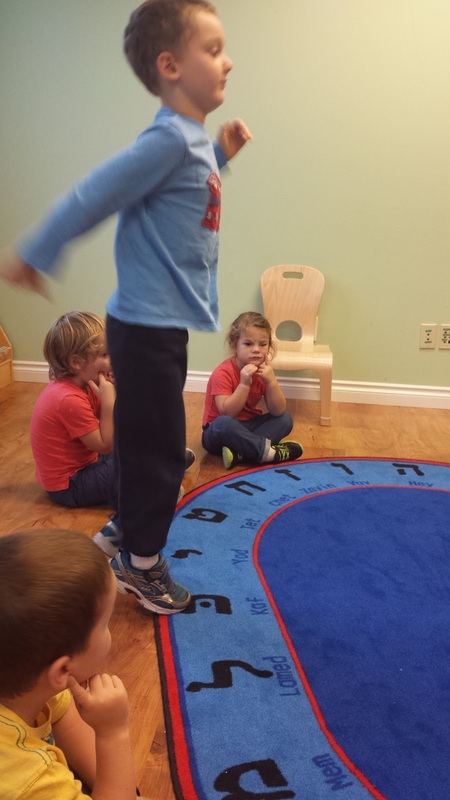 In the classroom the children need to use walking feet. On the playground, children can vary how they get from one spot to another. Will they run? Hop? Skip? Perhaps they will ride a bike. 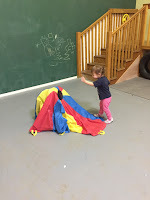 The children can play independently, or with a friend. They will work together creating plans and solving difficulties as they arise. Children become self-confident when they challenge their boundaries and experience success. 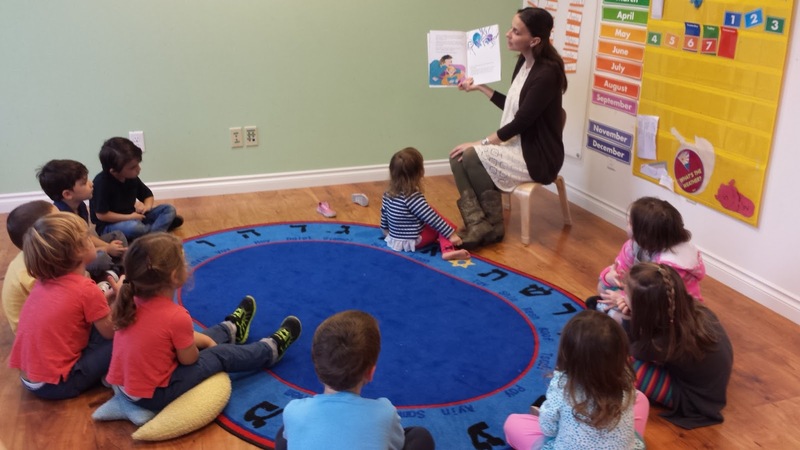 Story time supplies so many learning opportunities for young children. Books introduce ideas and help develop vocabulary. 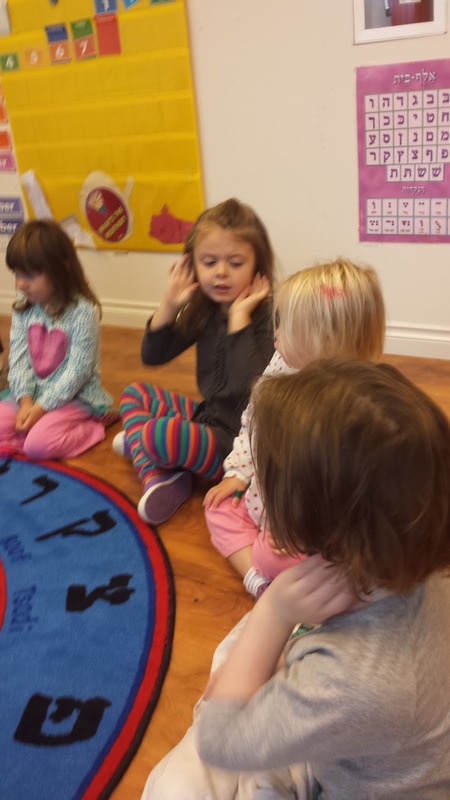 Listening to stories develops auditory processing, an understanding of spoken language. In addition, stories provide an opportunity for children to safely explore social situations which may cause them worry or stress. At The Gan we value each child's contribution to our community. 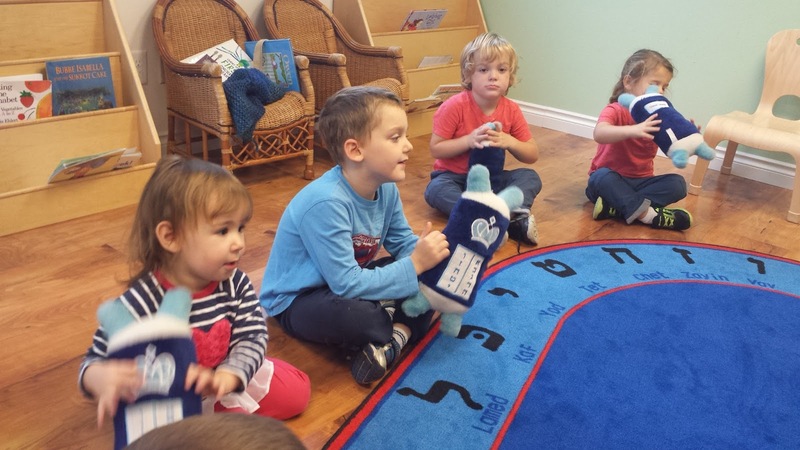 We demonstrate respect for each child by encouraging the free choice of activities during class time. When children initiate activities and discover materials on their own, they take ownership of their learning. Children are drawn to what intrigues them and that interest deepens their personal experience with the activity. Maya was having a challenging time, she could not find anything to soothe her or interest her, until she spotted a counting game. She chose the numeral leaves and began to count, soon Asher and Augie joined her. 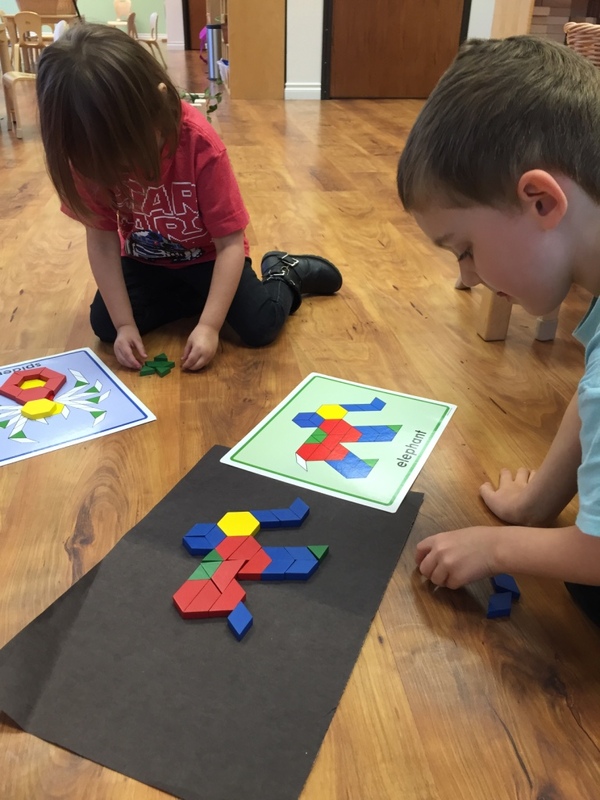 Child-initiated learning is encouraged by providing appropriate materials and by asking open questions to stimulate further thinking and problem solving skills. Morah Katie: What are you creating with the magnets? Olivia: I think it is a space ship but I am not sure yet. Morah Katie: What color did you create when you mixed the red and yellow? Nora: We used the red and the yellow. 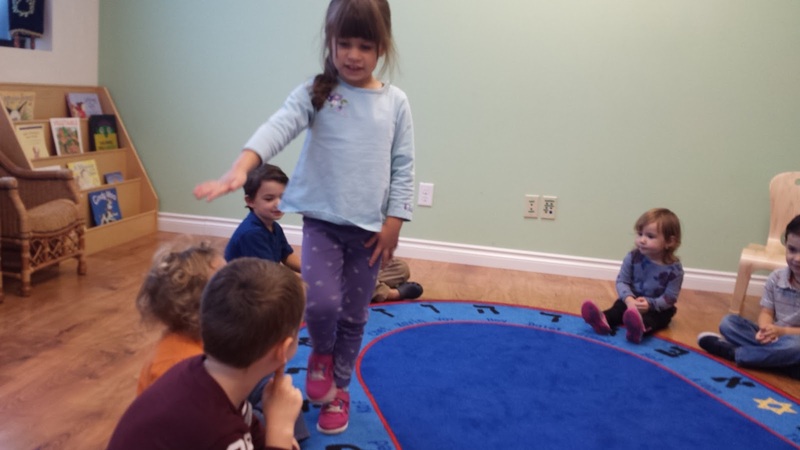 During free-choice time, children learn many important life skills. Children's literacy skills develop as they converse, pretend, and problem solve. Judah: Ok, we have to make the blessing for the candles. Are you ready? Judah: Now Sadie we get to have kiddush and eat the challah. Natan: We need the slicing thing. Judah: Matan, you mean the knife. what they will play with, and with whom they will play. Clara: I want to make a duck. Augie: I'm not so into the duck, I think I'll do something else. We begin the completion of our day with a meal. The children have spent the day playing and learning. After more conversations while in line to wash hands, the children gather their lunches. As soon as our lunches are set out, we say our blessing and enjoy our meal. Lunch time is a moment to reflect on what we have learned that day. It gives the children plenty of time to have conversations about their favorite things to eat, their favorite movie or something fun they did with their family. Our classroom is special because of what each child contributes to the community. We're so glad that you came today. As each child was greeted in the morning, each child is acknowledged and thanked for spending the day with us. There is a trend in early childhood education to focus simply on academic achievement in preparation for kindergarten, which has begun to resemble what a first grade classroom once was. Writing, reading and adding up and subtracting numbers can be very impressive in a preschool child (believe me it is very fun to watch children put it all together), but what happens to the child who hasn't learned how to positively interact with their classmates? My daily goal is for your children to be confident and happy, that they become children who love learning, and are socially capable.